As part of her library’s excellence award, Plymouth-Canton media specialist and technology coach Kathy Lester is available this year for mentoring and consultation. MEA member Kathy Lester has been working to reverse a dramatic slide in Michigan’s commitment to funding quality school libraries. Now she has an additional way to raise awareness that librarians are vital to student achievement in the Information Age. The middle school where Lester works as a media specialist and technology coach has won a state award that comes with the opportunity to mentor and consult with other school districts across Michigan. 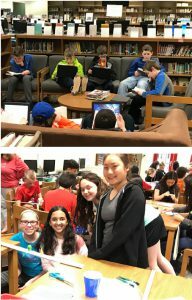 Lester’s East Middle School Library Media Center in Plymouth-Canton schools won the state’s 2017-18 Model 21st Century School Library (SL 21) award for excellence from the Library of Michigan, part of the Michigan Department of Education. Also known as media specialists, librarians in Michigan have seen their numbers slashed by 62 percent since 2003, compared to a nationwide drop of 17 percent during the same period. As a media specialist, Lester supports reading achievement, technology integration, and career and college readiness through teaching digital citizenship and research skills. The award acknowledges her accomplishments in three roles: building, teaching, and leading for learning. Lester curates the library’s print and digital collection; collaborates with teachers to integrate technology and digital literacy into lessons and projects; and leads among peers through professional learning communities and advocacy in state organizations and committees. In addition, Lester works with a partner teacher and community members to offer “maker” clubs during lunch and after school, which involve more than 100 students in “making” activities, including programming, robotics, graphic design, crafting, and more. Last spring, Lester invited staff from the offices of Michigan’s U.S. Sens. Debbie Stabenow and Gary Peters to attend East Middle School’s eight-day Science Innovation Maker Station project—to witness how a library can play a role in providing hand-on STEM learning experiences. For the next school year, Lester is available for consultation and visits with districts looking to add media specialists or improve school library programs. For information, contact Lester at Katherine.Lester@pccsk12.com or Karren Reish at ReishK@michigan.gov.